As I mentioned a few days ago, Activision has decided that if you want to play Modern Warfare: Remastered, you’ll have to purchase one of the premium editions of Call of Duty: Infinite Warfare when it drops on November 4th. Well, the pit fiends good folks at Activision released the trailer for their most recent cash grab installment in the Call of Duty franchise yesterday, and wouldn’t ya know it – some people didn’t like it! Go ahead, wipe the dust off your Gunnars, fanboys – that is a real number. 354K people have disliked the reveal trailer as of the writing of this blog, and it doesn’t seem like the ‘likes’ column is going to outweigh that anytime soon. Now, there’s no telling if this is actual backlash from the Modern Warfare debacle, or if maybe the internet as a whole is just fed up with having to pay unwanted fees to play games, but numbers don’t lie. People are pissed. 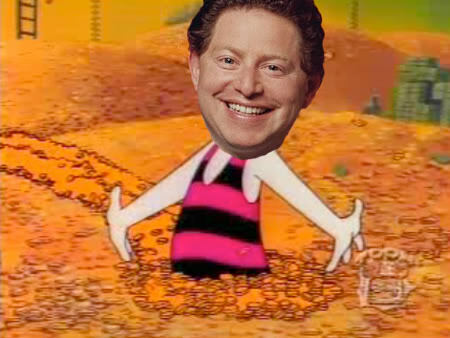 But mark my words, as sure as Bobby Kotick (Activision’s CEO) is the devil himself, Infinite Warfare will still sell six bazillion copies, and we’ll find ourselves in the same exact position next year when its Call of Duty reveal time again. I’d just hate to be that convenience store employee in a few months that has to clean up their store from all the torn open Doritos bags and uncapped Mountain Dew bottles after kids swarm their shelves to steal “Double XP” codes. I’ve seen it happen. And with that, I’ll leave you with an actual quote from Activision’s CEO to take you into the weekend. Enjoy.